This calculator will calculate the monthly payment amount required to pay off a given debt within the length of time you specify. You can either specify a goal payoff date, or a number of months. Plus, the calculator will also calculate how much interest you will save (earn!) by paying the debt off early. The results include a payoff comparison chart, a text summary, and a bar graph showing the interest cost difference. Enter the amount you still owe on the debt, but without the dollar sign or any commas. Due to future interest charges that may or may not apply, the amount you owe cannot be arrived at by simply multiplying your payment amount by the number of payments remaining. You may need to call your lender and ask what the current payoff amount is. Enter the annual interest rate percentage you are being charged for the debt, but without the percent sign (for .10 or 10%, enter 10). Enter the amount of your current monthly payment. Enter as a dollar amount, but without the dollar sign and any commas. Select the month and year you would like to pay the debt off by. Once a future date is selected, the number of payments field on the next line will automatically be populated with the number of months between now and your selected month/year. If you want to enter the number of months instead of selecting the month and year, simply enter the number of months in this field. This row compares the current monthly payment amount with the pay off goal payment amount. This row compares the number of payments remaining for the current payment amount and for the pay off goal payment amount. This row compares the total interest cost for the current payment amount and for the pay off goal payment amount. This row compares the month and year this debt will be paid off for the current payment amount and for the pay off goal payment amount. 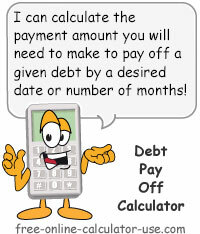 This calculator will calculate the monthly payment required to pay off a given debt within the length of time you specify. You can either select the month and year of your payoff goal, or you can enter the number of months. Plus, the debt payoff calculations will also tell you how much interest you will save by shortening the term of the loan. Finally, the results include a comparison chart, a text summary, and an interest cost comparison bar graph. If you shorten the length of time to pay off a debt, you will also reduce the total interest charges you end up paying to your lender. And when you reduce the interest charges you are essentially increasing your spendable income by the amount saved. So who would you rather see earn that extra income, you? Or your lender? Enter the current balance owed on the debt if you were to pay off the debt today. Either select the month and year of the date you would like to pay off the debt by, or enter the number of months to pay off the debt. Tap the "Calculate Payment Amount" button and scroll down to view the results.